Astronomie - Ist unser Universum ein Fake? Astronomie - Neue Studie über Dunkle Asteroiden, welche schwierig zu erfassen sind. Top: Actual Hubble observations of gas density in the central portion of two galaxies. Bottom: Computer simulations of knots of star formation in the two galaxies show how gas falling into a galaxy's center is controlled by jets from the central black hole. Astronomers have uncovered a unique process for how the universe’s largest elliptical galaxies continue making stars long after their peak years of star birth. NASA’s Hubble Space Telescope’s exquisite high resolution and ultraviolet-light sensitivity allowed the astronomers to see brilliant knots of hot, blue stars forming along the jets of active black holes found in the centers of giant elliptical galaxies. Combining Hubble data with observations from a suite of ground-based and space telescopes, two independent teams found that that the black hole, jets, and newborn stars are all parts of a self-regulating cycle. High-energy jets shooting from the black hole heat a halo of surrounding gas, controlling the rate at which the gas cools and falls into the galaxy. But what should be a monsoon of raining gas is reduced to a mere drizzle by the black hole. While some outwardly flowing gas will cool, the black hole heats the rest of the gas around a galaxy, which prevents the whole gaseous envelope from cooling more quickly. The entire cycle is a self-regulating feedback mechanism, like the thermostat on a house’s heating and cooling system, because the “puddle” of gas around the black hole provides the fuel that powers the jets. If too much cooling happens, the jets become more powerful and add more heat. And if the jets add too much heat, they reduce their fuel supply and eventually weaken. This discovery explains the mystery of why many elliptical galaxies in the present-day universe are not ablaze with a higher rate of star birth. For many years, the question has persisted of why galaxies awash in gas don’t turn all of that gas into stars. Theoretical models of galaxy evolution predict that present-day galaxies more massive than the Milky Way should be bursting with star formation, but that is not the case. Now scientists understand this case of arrested development, where a cycle of heating and cooling keeps star birth in check. A light drizzle of cooling gas provides enough fuel for the central black hole’s jets to keep the rest of the galaxy’s gas hot. The researchers show that galaxies don’t need fantastic and catastrophic events such as galaxy collisions to explain the showers of star birth they see. 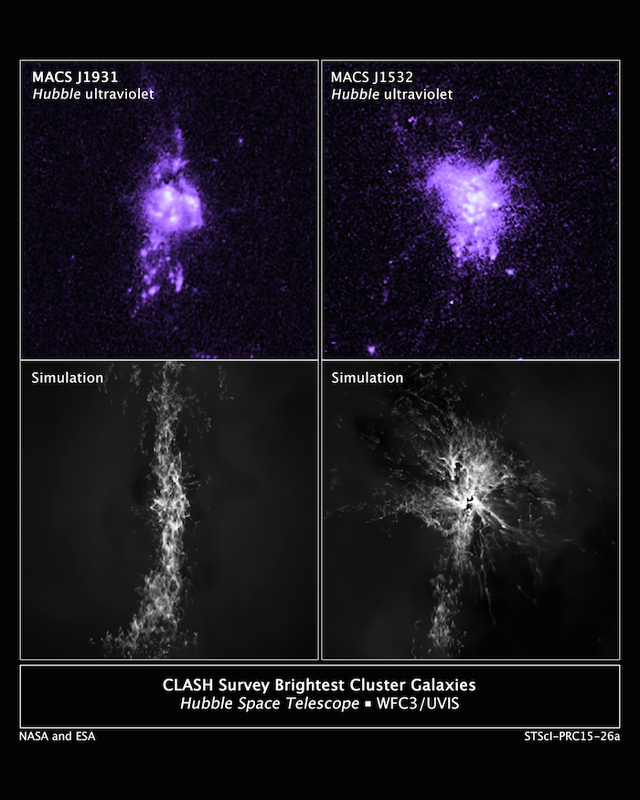 The study led by Donahue looked at far-ultraviolet light from a variety of massive elliptical galaxies found in the Cluster Lensing And Supernova Survey with Hubble (CLASH), which contains elliptical galaxies in the distant universe. These included galaxies that are raining and forming stars, and others that are not. By comparison, the study by Tremblay and his colleagues looked at only elliptical galaxies in the nearby universe with fireworks at their centers. In both cases, the filaments and knots of star-birth appear to be very similar phenomena. An earlier, independent study, led by Rupal Mittal of the Rochester Institute of Technology and the Max Planck Institute for Gravitational Physics, also analyzed the star-birth rates in the same galaxies as Tremblay’s sample. Along with Hubble, which shows where the old and the new stars are, the researchers used the Galaxy Evolution Explorer (GALEX), the Herschel Space Observatory, the Spitzer Space Telescope, the Chandra X-ray Observatory, the X-ray Multi-Mirror Mission (XMM-Newton), the National Radio Astronomy Observatory (NRAO)’s Jansky Very Large Array (JVLA), the National Optical Astronomy Observatory (NOAO)’s Kitt Peak WIYN 3.5 meter telescope, and the Magellan Baade 6.5 meter telescope. Together these observatories paint the complete picture of where all of the gas is, from the hottest to the coldest. The suite of telescopes shows how galaxy ecosystems work, including the black hole and its influence on its host galaxy and the gas surrounding that galaxy. Donahue’s paper was published in the Astrophysical Journal on June 2, 2015. Tremblay’s paper was published in the Monthly Notices of the Royal Astronomical Society on June 29, 2015.